By the time I joined, Essence of Time carried out the tasks of tank-borne infantry, that is, accompanied and defended the hardware during combat, guarded them on rest points and on bases. The Information Center was operating. 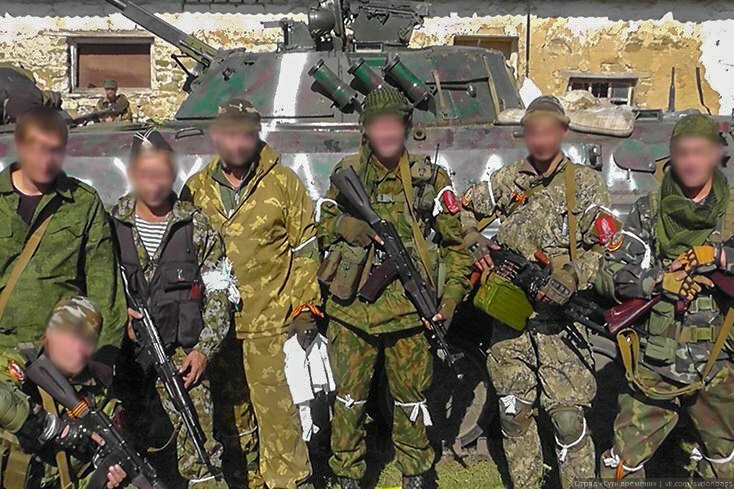 It produced video reports on the events in Donbass, carried out informational work among the personnel of the unit. Initially our responsibility were the tanks of Vostok brigade located in Panteleimonovka (a township between Donetsk and Gorlovka, which was recovered from junta’s forces with the participation of Essence of Time. Later a second place became our responsibility: IFV base in Yasinovataya (north of Donetsk). Essence of Time base in Yasinovataya was on the territory of the industrial zone. Preparation of training grounds started on the outskirts of the village for training with various types of arms. Having a real shooting ground and a permanent base drastically increased the effectiveness of training, allowed to uncover and eliminate the mistakes the militiamen made, significantly improved the quality of our training. During this work I was assigned to study the methods of using “officer’s briefcase” for training and checking the correctness of aiming, produce similar equipment, as well as study the methods of learning for correct fire-enabling — to later utilize in the process of preparation and training. The number of learning methods gradually enriched. The leaders of the Mission invited instructors and provided the requited numbers of ammunition for training. Thanks to this the level of preparation of the unit constantly increased. In Yasinovataya base the militiamen lived in quarters of 5-10 men. The order was maintained by 24 hour duties. Three people were guarded the IFV at night. As the personnel increased in number thanks to new arrivals, it become possible to organize two shifts of tank guard duties in Panteleimonovka. The everyday routine was as follows: 8:00 – get up from bed, morning formation, morning parade, breakfast; 10:00 – tactical and shooting training; 13:00 – dinner, rest; 15:00 – training continues; 18:00 evening formation, supper, personal time; 20:00 duties, private time, rest. This way, 24 hours can be, for the purpose of discussion, divided into two parts: training in the day, guarding in the night. Besides tactical and shooting training, coordination with tank crews was exercised, positions in the places of likely enemy’s breakthrough were prepared. Partial, and later full rotation took place each week. The personnel lived in Spartan conditions here: slept on the floor, cooked on campfires, brought water from nearby wells. Together with a tense schedule this created some serious load. Some didn’t endure and left to other units, but by doing so, they provided for the selection of the most persevering and driven people. This is how the core of Essence of Time combat unit in Donbass was tempered. This entry was posted in "Essence of Time" unit in Donbass, Articles and tagged Antifascism, DPR, Essence of Time. Bookmark the permalink.